Alphen aan den Rijn, Netherlands, February 20, 2018–Troi today announced the immediate availability of Troi File Plug-in 9.1 for FileMaker Pro 16. 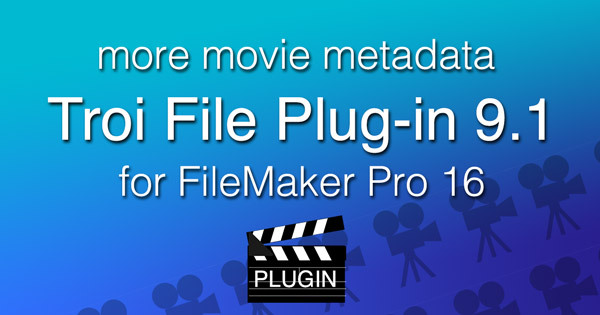 With added functionality for getting metadata from movie files, this plug-in becomes an even more indispensable tool for any company managing their image and movie files with the help of a FileMaker database. What is new in version 9.1? Added new functionality to the TrFile_GetMetaData function: when using the switch “-GetMovieMetadata” the plug-in now returns all metadata embedded in QuickTime movies (with extension .mov) and all variants of MP4 movies. This returns a list of metadata in the movie, returning for example Artist, Creation date and Description. Added new functionality to the TrFile_GetMetaData function: when using the switch “-GetMovieGPS” the plug-in now returns the GPS location data of the movie. With an extra -Format switch you can specify how the location is returned. Added new switch “-GetMovieCreationDate” to the TrFile_GetMetaData function: when using this switch the plug-in returns the creation date (including time + timezone) of the movie (if present as metadata). Added new functionality to the TrFile_GetMetaData function: when using the switch “-GetXMP” the plug-in now can read embedded XMP metadata in movies. The plug-in supports reading XMP metadata for QuickTime movies (with extension .mov) and all variants of MP4 movies. Added new TrFile_ResolveAlias function, which will resolve an alias file (on macOS) or shortcut (on Windows). It returns the path to the destination of the alias file. If the alias is broken you can use the switch “-ReturnLastKnownPath” to get the last path the alias pointed to. Added extra switch “-AddAliasInfo” to the TrFile_GetTypeOfItem function. If an item is an alias file (or shortcut on Windows) the result will be “file (alias)”. You can now add the “-DontResolveAlias” switch to the TrFile_SelectFileDialog function. When you select an alias/shortcut the result is the path to the alias itself (and not the destination path where the alias points to). (Windows) Added code signing to the plug-in for Windows (On macOS code signing was already added in version 8.0). Added new switch “-SourceUTF8CharSet” to the TrFile_GetMetadata function, to be used with the switch “-GetIPTC”. The IPTC metadata of the source image file will be forced to be read as UTF-8 encoded. Apart from these additions we fixed some possible problems in the Substitute and the GetFolderSize functions and we improved the working of the Substitute, SetMetadata and InsertContents functions on macOS 10.13 (High Sierra). More detailed information on all changes and improvements implemented in Troi File Plug-in 9.1 and earlier can be found on the File Plug-in page. A fully functional demo version of Troi File Plug-in 9.1 is available for downloading on the File Plug-in page. Upgrading to version 9.1 is free and recommended for all users of version 9.0: version 9.1 works with the same registration as the 9.0 version. Users who bought a license for Troi File Plug-in on or after May 10, 2016 are entitled to a free upgrade to version 9.1. Eligible users have been sent a new 9.0 registration. Contact us if you have not received yours. Upgrades from licenses bought before May 10, 2016, are available from US$ 59 per user. Upgrade prices for other licenses can be found in the shop. You can order upgrades there.